A new First-Time Home Buyer Incentive introduced in Budget 2019 aims to reduce the amount first-time buyers have to pay for a mortgage without increasing the required down payment. Canadian Mortgage and Housing Corporation (CMHC) is participating in “shared equity mortgages,” meaning it is sharing in the cost of qualifying Canadians for their mortgages. CMHC is offering 10 per cent of the total house price of newly constructed homes and five per cent for an existing home. While this lowers the monthly cost of the mortgage for home buyers, it’s important to note that the incentive is paid back to the CMHC when the owner sells the house. While total condo sales are down, all of the decrease is in condos sold under $500,000. Condo sales numbers by price range for February of 2019 versus 2018. While total condo sales are down, all of the decrease is in condos sold under $500,000. Lower sales for most markets usually mean that prices will decline as well. But, that is not necessarily true for real estate. Owners have two choices when the market slows: reduce the price or take the property off the market. They only choose the first option when they are forced to sell. Currently, mortgages in arrears in Ontario lent by the 9 banks are at a record low. The second area to look at is the buildup of listings if sales are soft. 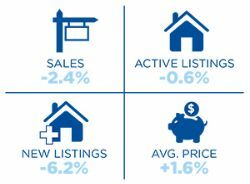 For February, ‘new’ listings for the month were 6.2% lower than for February of last year and ‘active’ listings at the end of the month were .6% lower than at the same time last year. Sales in the overall condo apartment market were down by 5.7% in February versus February of last year. The Downtown and Humber Bay markets are underperforming the overall condo market. Sales are down 9% over February of last year. At the same time, ‘new’ listings are up 2% and ‘active’ listings are 9% higher. The explanation is twofold. First, this market outperformed the overall market in the first six months of last year and prices increased by over 10%. Secondly, the entry point in the 416 is now $500,000 which discourages many buyers and most condos are priced much higher than that. Still, any condo priced under $600,000 will attract multiple offers. We have prepared a graph of condo sales by price range for February of 2019 versus 2018. While total condo sales are down, all of the decrease is in condos sold under $500,000. Downtown condo rental activity was down 13% from January. This is not unexpected as January is the start of the business year and the school half year. Still rental volumes were 5% higher than February of last year. It does appear that rental increases for vacant condos has started to level off. We compare rental rates for February of 2019 to February of 2018 in the Graph below. Many condo investors decided to rent their units out because of the jump in rents in 2018, but as rent controls impact investors when tenants stay, we believe we will start to see more units for sale. We would warn investors selling their unit that many buyers ask for ‘vacant possession’. If the buyer does not move in to occupy the unit, but instead intends to rent it out again, the seller will be liable for any fines and penalties under new legislation. How you protect yourself is something that you need to talk to an agent with condo expertise.